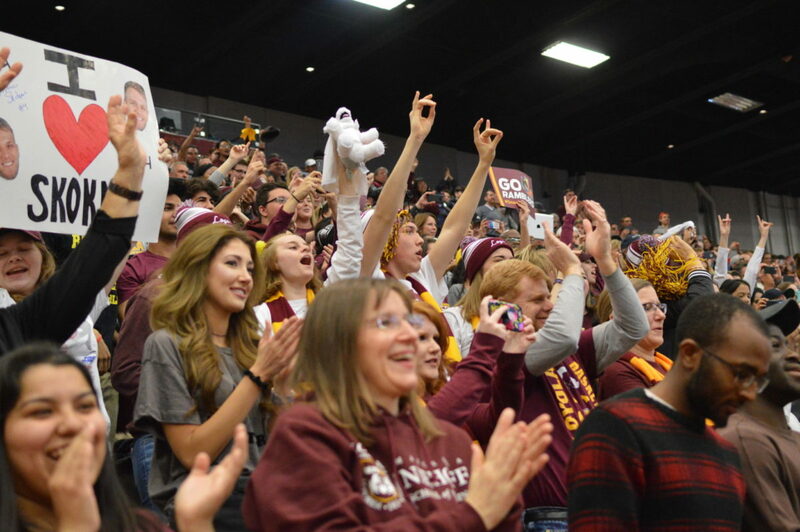 Alanna Demetrius | The PHOENIX Hundreds of rowdy Rambler fans, students and alumni cheered as the men's basketball team returned from their Elite Eight victory, signaling a reinvigorated spirit for sports at Loyola. Moser’s words echoed a sentiment shared between students and alumni as the men’s basketball team has stunned its way to the Final Four — Loyola, with a student body that’s traditionally been ambivalent to sports, has become a mega fandom in fewer than two weeks. Sports haven’t been Loyola’s biggest selling point. In recent years, the university touted its 2014 and 2015 NCAA championship men’s volleyball team. Apart from excitement at those, the 1963 men’s basketball championship and a brief 1985 March Madness run, sports enthusiasm at Loyola had taken a back seat. Now Loyolans can credibly claim bragging rights and embrace bouts against top-tier teams. Overnight, classmates have become sports celebrities and Sister Jean, a campus icon, has gone viral. Before all this, Moser said he tried to make appearances at every freshman orientation session advocating for student support. He schemed to get students to come to games, sometimes by passing out hot dogs in the Damen Student Center. Jonah Blatt, 20, said during his first year, seats in Gentile were often empty. During the 2016-17 basketball season, an average of 306 students showed up to games, The PHOENIX reported. 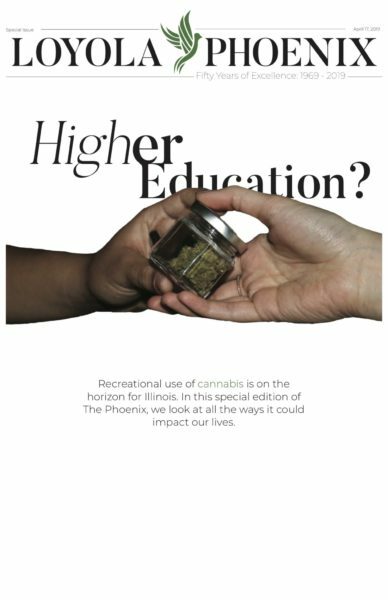 In December 2016, Moser penned a PHOENIX column strongly encouraging student attendance in response to the low turnout. Blatt said he thinks that’ll no longer be an issue. Max Kurinsky, a first-year dressed head-to-toe in Rambler gear, said he wasn’t aware of the basketball team when he enrolled at Loyola. With each tournament win, the crowd of spectators in Damen grew. With each stunning last-second shot, alumni emerged to cheer on a team often absent from the limelight. Longtime Rambler fan Bob Backis, a class of 1971 graduate, said the team’s miraculous run is something phenomenal, and has reignited a team he thought would never be this good. 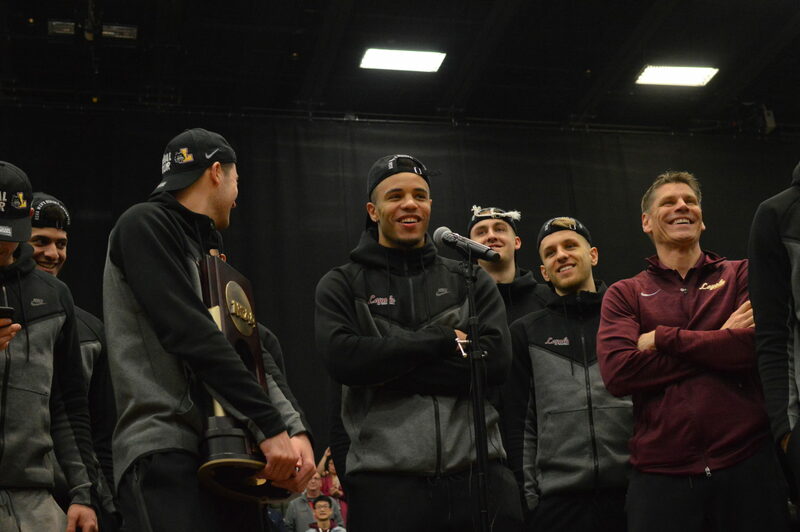 Former PHOENIX editors who covered sports on campus have expressed thrill and jealousy over the Ramblers’ March Madness performance. Nick Amatangelo, a 25-year-old reporter for KETV in Omaha, Nebraska was the paper’s sports editor during the 2013-14 academic year. He could only describe the Rambler fervor as unreal. He contrasted his tenure covering Loyola sports for a “largely apathetic” student body with Gentile’s sold-out game in February, when the Ramblers played the Illinois State University Redbirds. “We didn’t sniff that in four years when I was in school,” Amatangelo, who attended Loyola from 2011-14, said. Bridget Murphy, 23, oversaw the sports section during the 2014-15 academic year. She said she’s jealous she missed this incredible run. “I think anyone you could ask from the past would be over the moon if they could cover this,” Murphy, a class of 2016 graduate, said. Junior Darby Jones sat front row for the rally waving a homemade sign. After attending several games her first two years, she said she’s noticed the momentum build for the team this past season as a student worker for Gentile. She said she thinks it won’t stop here. 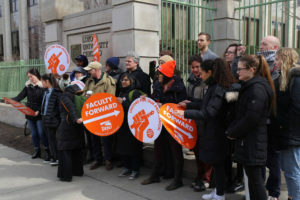 Averi Beck, a 19-year-old first-year anthropology major, said Loyola students finally have something to rally around after she said she was disappointed by lackluster spirit when she first started at Loyola. “It’s hard to get Loyola Ramblers hyped for something, so seeing them this amped up is really awesome,” Beck said.